After 9 months of diksha and worldly life abandonment Lord Suparshvanath attained (kevalgyan) salvation on sixth day of the dark half of the month of Phalgun and constellation of Vaishaka. On seventh day of the dark half of the month of Phalgun, Bhagwan Suparshvanath>, along with other 500 saints was liberated and attained nirvana on Sammet Shikhar (mountain). Bhagwan Suparshvanath lived for 20 lakh purv of which he spent 20 purvarg less of one lakh purv as an ascetics and 9 months of Meditation and Spiritual Practices (sahdana/tap). 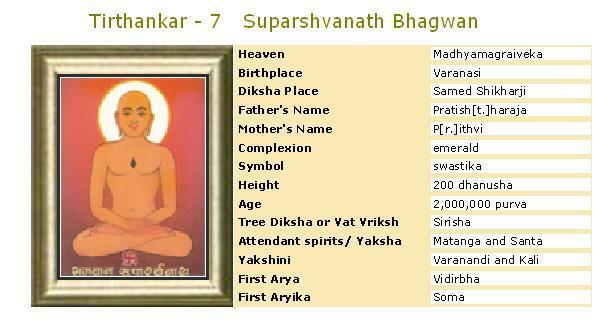 It is believed that Suparshvanath prabhu was 200 measure of bow(at that time unit of measurement was bow i.e. bow of bow & arrow) in height.